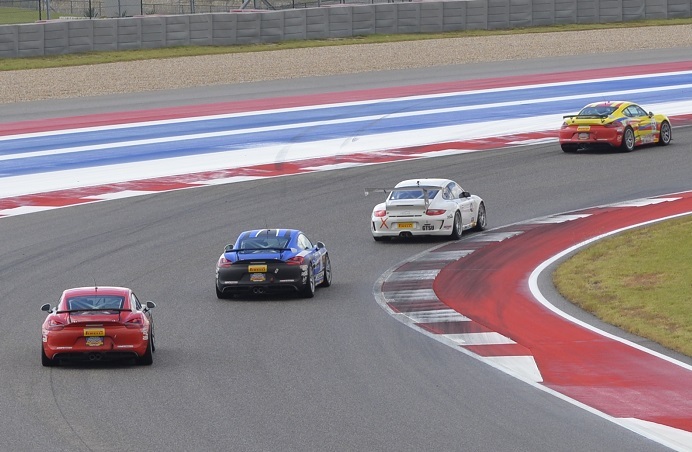 Austin, Texas – In rapidly drying conditions, Competition Motorsports’ Mark Nelson took the green flag for today’s Pirelli GT3 Cup USA Trophy season-finale at Circuit of the Americas from the pole position and never looked back, taking his first victory of the year. But behind Nelson, the battle raged between the top-five, with positions constantly changing through the rain shortened event. Nelson – a former Platinum Class champion – had earned the pole position in his No. 46 Porsche 911 GT3 Cup Car earlier in the day and refused to relinquish the top spot. 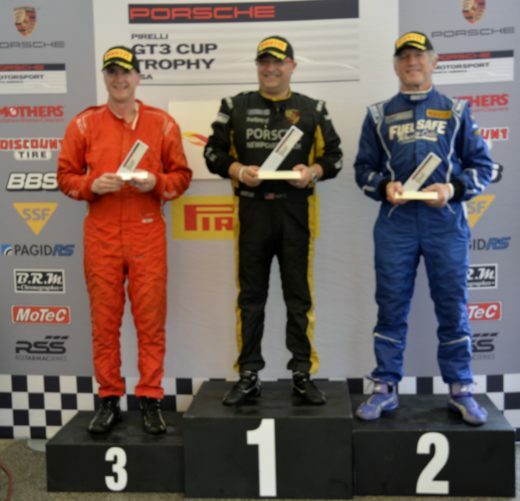 He stayed in front of his Diamond Class competitors at the start, and once again on the restart following the race’s only full course caution, to earn his first victory of the season. Nelson’s relatively uneventful race was not indicative of the fight for the podium spots behind him, however, as four drivers battled throughout the race, swapping positions with clean and aggressive racing. In the end, Kelly-Moss Road and Race’s Russell Ward took his second podium of the weekend with a runner-up finish, with Nelson’s teammate Michael Zuieback coming home in third position. With conditions quickly shifting from dry to outright downpours in the hours before the race, each team had a decision to make: head out for the eight-lap, 20-minute event on wet tires, knowing the track was quickly drying, or make the risky move of starting the race on slick tires and hoping for the expected rain to stay away. 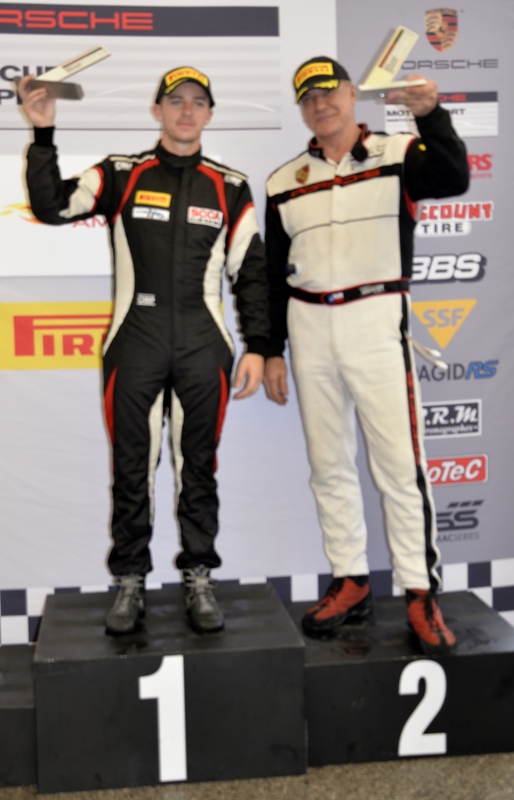 In the end, both Aasco Motorsports drivers chose the latter, contesting their Platinum Class race on slick tires. Alex Kirby started his No. 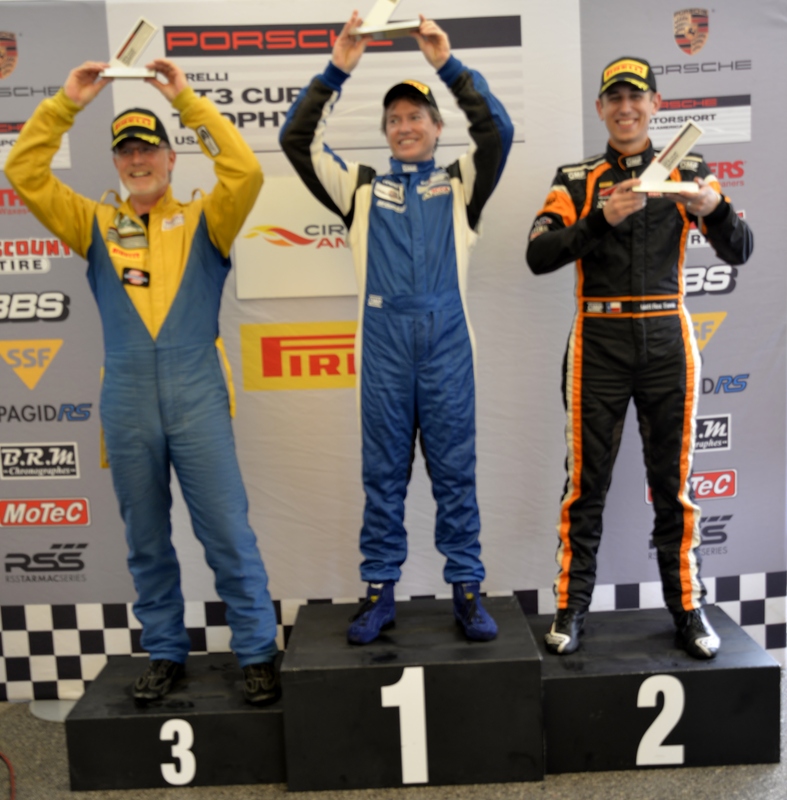 01 LA Prep Porsche second overall but had to concede positions early in the race, as the track remained wet and he fought for grip. But as the track dried out, the race came to him as he brought the car home for his second victory of the year, ahead of his teammate John Krieg. Ray Shahi put his No. 65 Sterling Collision/Newport Porsche/TruSpeed Autosport entry on the Platinum Masters pole and maintained his position in the difficult conditions, coming home ahead of championship leader Larry Schnur (TruSpeed Autosport) and David Lockwood (Air Power Racing). With torrential downpours and lightning in the area just after the GT3 qualifying session on Sunday, the starting positions for the Silver Classes were determined by placement in the morning’s practice session. 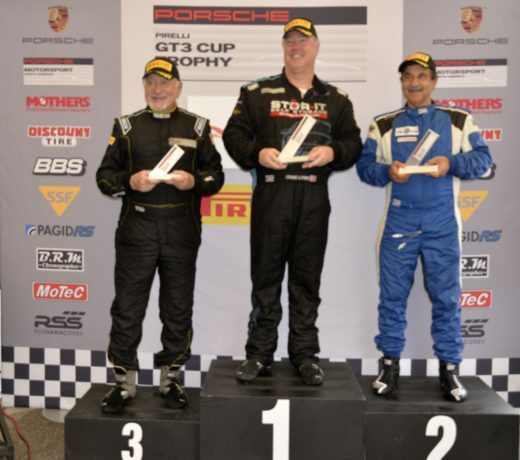 NOLA Motorsports’ Keith Jensen started from pole position in the No. 51 Porsche Cayman GT4 Cup Car and held the lead for his fourth victory of the season. 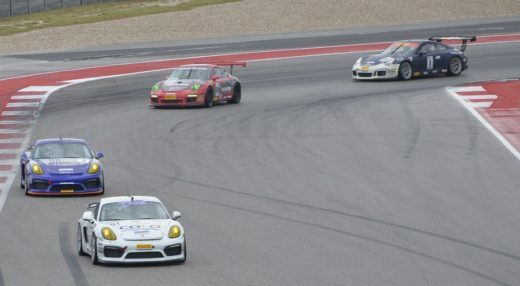 Behind Jensen, the championship title contenders battled for both position in the race and for the title honors. With Kevin Woods starting fifth in his No. 94 BR Racing Porsche, and Sean McAlister seventh in his No. 00 Competition Motorsports entry, the fight had only just begun when McAlister came upon another Silver Class competitor, who had spun and was attempting to re-enter the track. McAlister took the worst of it, with damage to the side of the car that sent him to the back of the field. Woods finished fourth, behind second place Matthew Travis (NOLA Motorsports) and Carl Tofflemire (Competition Motorsports), with McAlister ultimately finishing 10th. Jensen was understandably happy with his race and the opportunity to put his rain skills to good use. 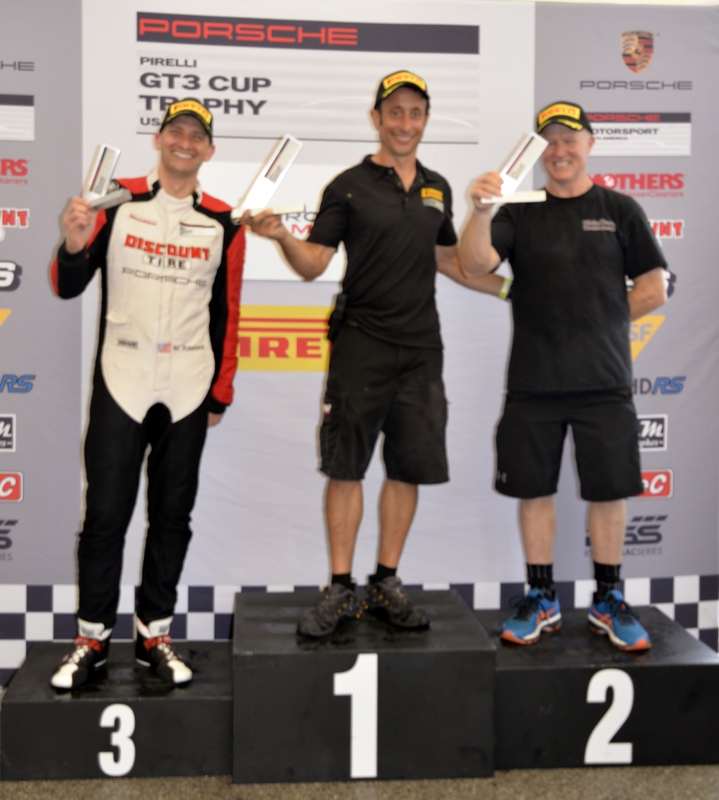 While Silver Masters championship leader Steve Goldman missed the final race due to a business commitment, TRG’s Craig Lyons took charge, bringing home his first win of the season ahead of Competition Motorsports’ Chris Vivolo and Kelly-Moss Road and Race’s Dan Weyland. 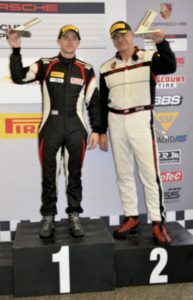 Pirelli GT3 Cup Trophy USA President Greg Franz was thrilled with the outcome of the season-finale. Competent Motorsport thanks all of its competitors for a great year of racing!